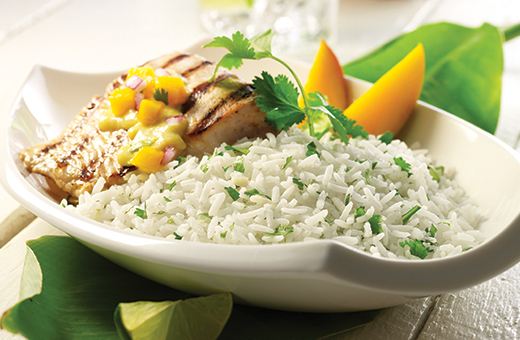 Grilled Mahi Mahi with a tangy salsa marinade … cilantro, ginger and mango. Served over coconut and ginger flavored Thai Jasmine rice. Get the vitamins and fiber your body craves with wholesome Mahatma Brown Rice. With a great nutty taste, it’s the healthy start to your meal. In a large bowl, combine ½ cup cilantro, 1½ tablespoons ginger, diced mango, brown sugar, lime juice and 4 ounces lite coconut milk. Reserve one cup of this mixture, cover and refrigerate. Purée remaining mixture. Place fish fillets in large plastic or glass dish. Pour puréed mixture; cover and refrigerate at least 1 hour. Preheat grill to medium heat and lightly coat grill rack with oil or cooking spray. Remove fillets from marinade and place on prepared grill rack. Cook the fish, brushing several times with puréed marinade, until it is cooked through and opaque in the center, turning fish after 4 to 5 minutes, until desired doneness. In a medium saucepan combine jasmine rice, 1/2 cup of water, remaining coconut milk, remaining ginger and salt (if desired) bring to a boil. Reduce heat and simmer on low heat for 15 minutes. Or, if you prefer whole grain brown rice, combine 1 cup brown rice, 1-1/4 cups of water, remaining coconut milk, remaining ginger and salt (if desired) bring to a boil. Reduce heat and simmer on low heat for 45 minutes. Fluff with a fork and stir in remaining cilantro. To serve, divide rice evenly on the center of four plates. Top with one cooked fish fillet. Spoon ¼ cup reserved marinade/salsa over fish. Garnish with fresh cilantro, if desired.